As 2018 is starting, it’s a good time to start planning your marketing strategy for the year. There are some major developments that you need to be aware if you want to grow your business. 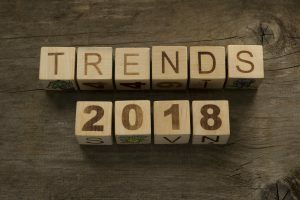 Let’s explore the three leading 2018 small business trends. When considering small business trends, we can’t overlook the continuing rapid growth of mobile. It’s no longer enough to be merely mobile-friendly. Mobile devices are getting increasingly popular and more and more customers are shopping via mobile. If you sell products online, you have to make it easy for people to access your website and make purchases from mobile phones. Even if you have a brick and mortar business, many of your customers will look up your website using a mobile device to find out about your products, hours and location. Small businesses must prioritize mobile customers when they build their websites and post content online. In an age when we hear so much about AI, machine learning and automation it may seem counterintuitive to think that one of the biggest small business trends is more personal service. However, as automated tools are used more frequently, they create a certain backlash. Even as customers appreciate the convenience of chatbots and automated services, they also want to feel like they’re dealing with actual human beings. Businesses that provide personalized service, whether in person, on the phone or online will have an advantage. This doesn’t mean you have to handle everything on a person-to-person basis. Use automated tools when necessary but reach out in a personal way for important interactions. A short phone call or personal email goes a long way towards building strong relationships with customers. The best way to run your small business in 2018 is to find the right balance between high tech and personal service. Small businesses always need to find ways to cut costs and improve efficiency. With the growth of cloud computing and freelancing, it’s now easier than ever to outsource many tasks. You can now communicate with contractors anywhere in the world using platforms such as Skype and video conferencing software. Documents can be stored and shared on cloud platforms such as Dropbox or Google Drive. It’s often more economical to hire contractors on a per-project basis rather than full-time employees. Depending on your needs, you might hire freelancers for web design, SEO, content writing, PR, customer support or other tasks. Outsourcing and taking advantage of cloud-based services help make your business leaner and more efficient. These are a few of the major 2018 small business trends that you should pay close attention to. While none of them are brand new, they’re all on the upswing and will only get bigger in the next few years. Another issue that has a huge impact on your business growth is cash flow. If you want to grow your small business in 2018, consider invoice factoring, a process that allows you to receive immediate cash for your invoices. Riviera Finance has helped companies improve cash flow with invoice factoring for nearly 50 years. Get Started today!